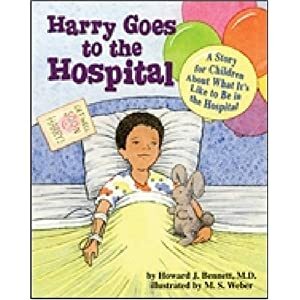 Harry Goes to the Hospital « Howard J. Bennett - Pediatrician and Author in Washington, D.C.
Harry is sick and has to go to the hospital. But he’s never been to a hospital before, and he’s scared. There are lots of new people to meet, he gets poked with needles, and he has to spend the night in a strange place. But with his parents’ comfort and the help of lots of doctors, nurses, and his stuffed rabbit, Barney, Harry learns that the hospital doesn’t have to be a big, scary place.